Dr. James A. Lewis, Sr. is the pastor and founder of New Testament Christian Center Church located in the heart of Columbus, GA. He began his ministry at Gethesemane Baptist church in 1962, at the early age of eleven years old. Dr. Lewis received his formal education in the public schools of Columbus, Georgia where he was a 1969 graduate of Spencer High School. His education continued at Albany State College in Albany, Georgia; Georgia Southwestern College in Americus, Georgia; and American Baptist College in Nashville, Tennessee where he received a Bachelor of Arts degree in Biblical Theological Studies. He earned the Master of Divinity in Pastoral Care and Counseling at the Interdenominational Theological Center in Atlanta, Georgia and Morehouse School of Religion. 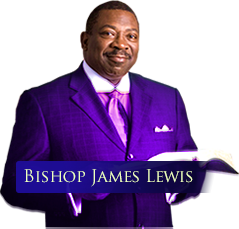 Dr. Lewis earned the Doctor of Ministry Degree from United Theological Seminary, Dayton Ohio. He later received a Doctor of Philosophy Degree in Ministry from Friends International Christian University in Merced, CA. Dr. Lewis is married to the former Miss Wilhelminia Bembery of Vienna, Georgia. They are the very proud parents of Kayce, James Jr., John David, and Daphyne. Dr. Lewis is the author of "Strengthening the African American Family by Empowering the African American Male." He is also the producer of three albums: "Going to Heaven and can't get in"; " Driving by the gates of Heaven and parking in hell" and "The Sparrow has found a home." Dr. Lewis has served on several boards in Columbus, GA and continues to be a voice declaring the saving grace of God through Jesus Christ.